As travelers, we're familiar with feeling like the new guys or gals in town, but that doesn't mean we need to settle for any old bar or dance club when it's time for a night out. 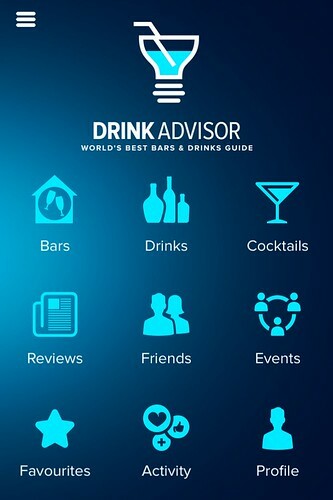 Enter DrinkAdvisor, a comprehensive, and more importantly free, mobile app available for both iPhone and Android that delivers high quality bar and club listings for over 200 of the world's largest cities. Once you've downloaded the app, it's quick and easy to get started. Users have the option of signing in with Facebook, Twitter or Google+, or if they prefer, registering with an email address. You also have the option to skip registration. Inside, you'll find a beautifully designed experience. Navigation is simple, clear and intuitive, making it easy to use and find what you're looking for. My home base of Medellín, Colombia hasn't been added yet, so I set my sights (or should I say fingers) on New York City, where I'll be headed in late August to visit my brother and friends. Seeing as how the app is building content based on the largest cities first, it's important that it features a robust search and filtering system. DrinkAdvisor features 28 options for narrowing down the list of venues to exactly the kind you're after. 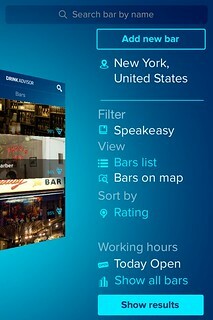 I filtered NYC based on two of my favorite types, the speakeasy and the rooftop bar. The results loaded quickly, set to a default order based on user ratings. I began clicking on the listings one by one to see more photos, the locations and read the concise and informative descriptions. The business hours are also available for every day of the week, which means no searching the web or guesswork if you want to confirm a place you like is open when you want to go. 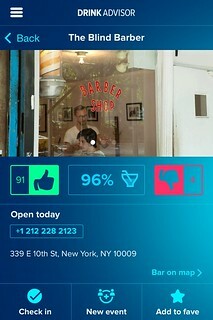 From each bar listing, it's possible to take any number of actions including favoriting the place for offline viewing (key if you're not around WiFi and don't have local data coverage), checking in, listing a new event there, leaving a review and viewing user-submitted photos (or uploading your own). I like the fact that the content and bar listings are curated, yet there's room for crowdsourcing user reviews and photos. I always feel as though that approach brings more balance to what's recommended. There were more than enough listings for me to choose some favorites convenient to where I'll be staying in NYC, and I'm sure my brother and friends haven't heard of some of these places, despite living there. 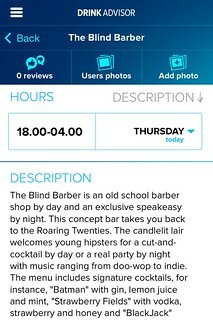 According to DrinkAdvisor, new bars are being added daily. The Drinks section lists popular liquors like whisky, vodka, rum, gin, tequila, as well as sake and beer. Each drink type includes fun facts about how to drink them, how they're made, and an introduction to global brands. If you're sitting in a bar waiting for friends or a date to arrive, this section could be fun to read. You might even pick up a fact or two to use that night. If you're feeling in the mood to mix your own drinks, there's the Cocktails section with popular drink recipes. We live in a social world, so it's no surprise to see the app offers various ways to connect with your friends, either through Facebook or Twitter. There's even an event-planning functionality that lets you use the app to organize get togethers. Drinking and nightlife are a big part of most travelers' agenda, whether you're living it up for a few days of vacation, or on a multi-month journey around the world. To stay up-to-date with the coolest places to enjoy a drink as you travel, or even in your home town, download the free DrinkAdvisor app in iTunes or Google Play. This post was brought to you by DrinkAdvisor. 28 filtering options, that’s amazing! 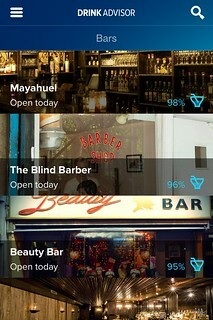 Really great idea for an app and it looks really easy to use, I think it will take off. Twenty eight ways to filter! That is awesome! So they have added new features since I stopped using the app a few months. I think I should give it a second chance. And Dave, can you shed light on what cities have been covered? I used SeekMII. They claim to have covered the entire U.S. This is great, so many apps anymore do only half of their potential. It’s going to be a great add to a busy travel schedule, because sometimes the most fun is finding that little hole in the wall restaurant that has amazing food, or a pub whose ambience is legendary. So many wasted hours of running circles to find a nice bar..